THE cruise industry, once seen as the preserve of elderly Americans, seems to be undergoing a slow but sure change. Passenger numbers are clearly going up as younger travellers take interest in the high seas. Even families with young children have taken to cruises as is evident in fast-moving family packages offered. 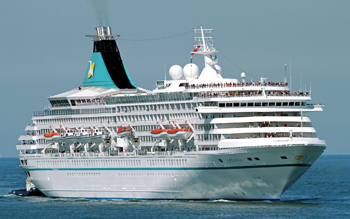 North America, needless to say, is the world’s largest cruise market, followed by Europe, with European traveller numbers up 44 per cent to 6.4 million in 2013 during the five years from 2008. The industry, on the other hand, has grown in value by 22 per cent and is now worth more than 39 billion euros. The cruise industry currently represents more than 27 million passengers in the Mediterranean, a number that has increased by 23.6 per cent between 2009 and 2013. Another line of investigation says that the Mediterranean is likely to overcome the Caribbean and become the first world cruise destination. The World Travel Market exhibition floor is flooding with cruise options this year. We have a round-up of all the interesting deals. European Waterways will offer travellers the chance to visit significant World War One sites for three six-night, all-inclusive trips on its 12 passenger luxury hotel barge ‘La Belle Epoque’. The World War One Commemorative Cruises will pass along the Canal du Nord and Canal de la Somme, right in the heart of the battlefield areas, and will depart on April 5, April 12 and April 26. Other themed canal trips available include dedicated antiques cruise on the Thames in England, grape beverage-appreciation cruises through France and trips through the tulip field of Holland during spring. The US is European Waterways’ number one international market, followed by Australia and New Zealand. It is targeting buyers from other markets such as Canada, Germany, Brazil, South Africa and Scandinavia. Ullswater Steamers will be enticing tourists to England’s loveliest and second-largest lake this year. Ullswater is a ribbon lake, which is 62 metres deep at its deepest point and has three distinct reaches. The landscape around Ullswater was shaped by the last Ice Age and is stunningly scenic. The name ‘Ullswater’ may derive from ‘Ulfr’s Water’, possibly named so in honour of a Viking lord. Many myths surround the lake. Martindale is said to be the last place in Cumbria at which fairies were seen and if you throw money into Kailpot Crag, it is said to bring luck. Some believe that Ullswater is the lake in which King Arthur found Excalibur. In medieval times, it was believed that monsters lurked in the dark waters of the lake. Five heritage boats currently carry passengers up and down the lake between piers and also round the lake, on tickets that enable them to hop off and on all day and enjoy the network of footpaths, which criss-cross the fells. Ullswater ‘Steamers’ offers a ‘Pay Once: Sail All Day’ option in the form of its Round-the-Lake Pass. This costs just £33 ($53) for a family in 2014 and allows the passengers to hop on and off boats all day, making the most of the cycle and walking routes that link to the pier houses. Vietnam’s Emperor Cruises combines oriental charm with contemporary luxury, creating the perfect recipe for adventure. Luxury Travel Ltd and cruise company Huong Hai Ha Long Ltd will usher travellers into one of the world’s most beautiful bays, Nha Trang in Vietnam. Emperor Cruises have been inspired by the lifestyle and recreational interests of Emperor Bao Dai when he used to stay in his villas in Nha Trang and sail in the bay to go fishing around the offshore islands. Almost a half century later, Emperor Cruises have recreated his vessel and made it fit for an emperor. Day cruises around Nha Trang Bay will begin in February 2015 along with sundowners and dinner on board. “Emperor Cruises will also launch overnight luxury cruises in June 2015 in world-famous Nha Trang Bay, accommodating 30 people in 15 en-suite cabins, the first in a total of five cruise ships in this particular project, with each one designed to be a sanctuary where every moment counts for our guests.” says Bui Duc Long, owner and director of Emperor Cruises. Russia tops the number of visitors to Khanh Hoa Province with about 150,000. With significant numbers from Australia, America, France, England and Germany, the area expects to receive around eight million tourists in 2014. Visitors can now learn about New York with guided tour commentary while traveling between ferry hop-off stops with City Sightseeing New York Cruises. Daily, reservation-free tickets are available for one-day access ($29 for adults) and ferries depart every 30 minutes from the World Financial District, Dumbo (Brooklyn) and Pier 11. Guests will navigate New York’s East River and get the best view of the Statue of Liberty, Ellis Island, Battery Park, Governor’s Island, Brooklyn Bridge, Manhattan Bridge, Williamsburg Bridge, South Street Seaport, Chrysler Building and more. The Brooklyn stop is convenient to the CitySights NY double decker touring and is included with the All around Town Tour package.